Before we recreated the D-Day landings enough time to wipe out more Nazis than the Second World War ever could, there was Wolfenstein – an anarchic and revolutionary title that spawned the first-person shooter and threw in a giant robot Hitler to boot. With enough years away from the scene that shooting Nazis in the face seems a welcome respite from all these undefined, differently-coloured terrorists, the franchise that birthed an entire genre is back and ready to get stomping on some Aryan behinds. 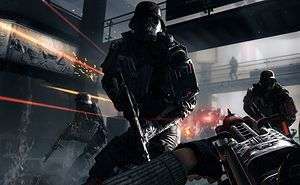 Brought to you by ex-developers of The Darkness, Wolfenstein: The New Order is a single-player-only title that takes place in an alternative reality where William “BJ” Blazkowicz – long-time Nazi-exterminator – escapes from an asylum some fourteen years after losing his memory in a secret mission gone awry, only to find himself in a strange time where everything he fought for has been crushed under the heel of Hitler’s regime, as the Germans found themselves the victors thanks to the use of powerful never-before-seen super-weapons. Tasked with helping to launch the counter-offensive against the tyrannical Aryans, BJ must travel across Europe and attempt to save the world from its oppressors. Billed as more of an adventure-orientated affair than previous Wolfenstein titles, we were first introduced to one of the main antagonists of Blazkowicz’s mission, the intimidating Frau Engel and her subservient lackey, as while BJ is fetching some coffee for one of his friends he’s cornered by the megalomaniac officer on the way back to his train carriage and forced to prove his Aryan worth to her. Here, our hero is made to answer an impromptu psychological survey, wherein the player is asked a series of questions and told to prove that they could make a model member of the Nazi party, with imminent death for anyone who fails. More a considered, Tarantino-esque dialogue than the gun-toting fare the series is known for, the scene grows more tense as each question is posed, with one final answer causing Engel to suddenly grab your wrist before you’ve even tapped the correct card on the table. All throughout, a gun rests on the table, with an assurance that if you dare go for it that you’ll be dead before you hit the ground. Besides, even if you did somehow successfully off your antagonist, there’d still be her smarmy side-kick and the minigun-equipped robot in the corner to concern yourself with before the coast became clear. Once the test is over, you’re free to go on your merry way, and though the outcome made me question whether it would actually matter what choices you made, it wouldn’t have felt out of place in a thriller, and it won’t be the only such sequence in The New Order that will put slow-paced tension above the gung-ho sentiment peppered throughout the rest of the story. To assure us it won’t just be nerve-wracking conversations with old Nazi ladies, we were shown a second sequence much later in the campaign, which begins with BJ launching an all-out one-man offensive against his German overlords and given the opportunity to play through a third sequence somewhere in-between the two. As the series that introduced gaming to the idea of shooting Nazis in the face, playing it safe and attempting to catch up to the new rulers of the first-person is out of the question, and instead MachineGames have done things their own way to great results. Shooting isn’t a case of popping up from behind cover and blasting foes away, but now Blazkowicz can lean out from cover in any direction – players can even lean under their cover if the opportunity arises and take out their foes feet-first. This also means that players don’t have to remove themselves entirely from cover, giving a more tactical feel to the gunplay, even if it’s still quite fast-paced and cover isn’t absolutely everywhere – the layouts and levels are designed in a way that feels realistic and more true to aesthetic, rather than slapping a bunch of objects everywhere to hide behind. As a result, the shooting feels both quick and strategic, with dispatching your foes becoming frantic and engaging rather than a tedious slog through corpses-in-waiting. Helping the action along is the wide arsenal of weapons at your disposal, but don’t expect it all to be realistic, era-equivalent wares. 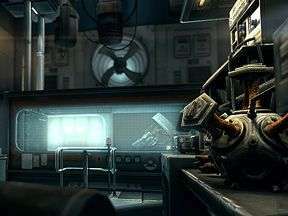 One such tool in BJ’s kit included a laser-gun whose alternative firing mode could allow the player to cut through wire-fencing, with this action actually necessary to progress through the early events of the playable demo, as our hero is forced to find a way into one of the London-based Nazi compounds and help raze it to the ground. Cutting an imperfect Blazkowicz-shaped hole in the fence, the player must then navigate the area safely and stay out of the jaws of the guard dogs, giving ample opportunity to learn how to slide around the environment, which can be used for safely traversing between cover – or for a style-over-substance murder of a Nazi or two – but was used in this instance to escape a piece of collapsing scenery. As he’s confronted by some alerted guards, it’s here that you can test out the power of your wire-cutting tool by using its alternative firing mode, sending some lasers deep into the flesh of your foes although, admittedly, it’s a more effective tool than it is a weapon, lacking some of the power of its less-futuristic counterparts; at least, that’s how it felt when I found myself with a pistol in hand and blasted my enemies away with that instead. Although futuristic weaponry didn’t entirely appeal, the ability to dual-wield a variety of weapons – shotguns and machine guns included – certainly did, and as I stormed the enemy base of operations I found myself giddily dispatching my foes with two machine guns and a grin. As the next wave of enemies appeared, I discovered a nearby turret, ripping it off its stand to make my Nazi-annihilation a bit more mobile. Rather than everyone hiding behind and intermittently peeking out of cover, the dynamic felt much more like both sides were charging at each other and seeing who could get out of the scrape alive, making it all the more satisfying when the skirmish is over and you’re standing over a pile of freshly-deceased bodies. Scavenging supplies from your former aggressors doesn’t just relinquish ammo to continue the fight, but can also cough up some armour or health, and this is another area where things get interesting. Both values are represented by a percentage, with the health very slowly replenishing if you’re out of danger and running under a hundred, but the armour won’t recover unless you pick up more. This isn’t the entire story though; rather than wasting any health collected when you’re fully-healed, the health counter actually goes up to two-hundred, but this will slowly deplete until it’s restored back to its standard level. With this, MachineGames have found a fascinating compromise between the health-guzzling days of old and the regenerating mechanic of the present, and it proves to be one of The New Order’s best features, adding to the intense feel of battles, providing a new level of strategic thinking and giving the players an immense sense of power when they’re able to charge at Nazi hordes with little fear of death. Even with the occasional moment where the action steps more into the levels of power-fantasy than against-all-odds, The New Order is far from easy, and if you’re not careful you’ll find yourself come a cropper more often than not. 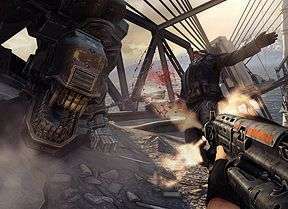 Within the demo – with the difficulty set to normal – I found myself dropping dead a fair few times, yet I never found any of the deaths to be unfair, rather moments where I’d run low on ammo or be forced to reload as the Nazis pushed forward and, had I more time to finish it before having to move on, I’d not have given up on the giant mechanical foe that suddenly blocked my path. While Wolfenstein doesn’t necessarily have boss battles per se, it does have more powerful foes that require a greater level of strategy and quick trigger fingers to take down, and provided they don’t end up as unfair bullet-sponges, could serve to be a highlight of the action. As a series synonymous with the first-person shooter and mechanical dictators, The New Order could easily have phoned it in and given us another exercise in Nazi genocide but, instead, it’s providing something far more appealing. 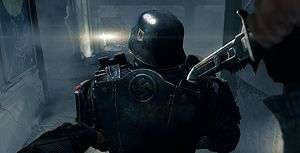 With former developers of the title on-board for the new Wolfenstein, it’s hard not to find myself comparing The New Order to The Darkness on more than a subconscious level; although neither were destined to become the top shooters of their year (a feat made even more impossible for the former thanks to BioShock Infinite), the latter managed to carve its hole in the market and provide one of the more memorable experiences of this generation thanks to its unique takes on established genre mechanics and the introduction of some new ones. That’s how I imagine Wolfenstein: The New Order ending up; it may not become the ultimate must-have shooter, but it combines slick gunplay with tense moments and ballistic action in a way that will make it a worthy purchase for any fan of shooting people in the face, especially if they happen to be wearing uniforms and heiling a giant robotic Hitler.